So light, yet so tasty! I almost did not get this post up tonight because I could not find my camera cord. Lucky for both of us I found it tucked away in my suitcase left behind from our honeymoon...oh how I wish I was still on vacation. Time to get back to reality and with reality there are several positive things such as baking! One of my favorite summer desserts is Angel Food Cake with fresh berries and whipped cream. It is perfectly sweet and so light that it satisfies your sweet tooth without weighing you down. I served this cake to some of our friends a couple weekends ago and not only did they all love it, but I even converted one friend from hating Angel Food Cake to loving it! 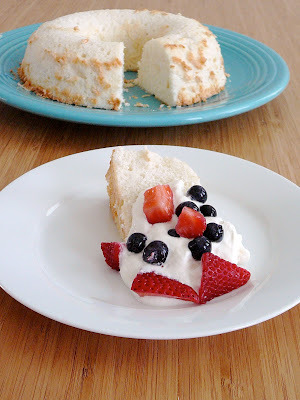 If all you have ever tasted is store bought Angel Food Cake, like my friend, then I forgive you for hating it. Just give this recipe a try and you just may be converted too! Place egg whites in a mixing bowl; let stand at room temperature for 30 minutes. into an greased and floured 10 inch tube pan. Cut through batter with a knife to remove air pockets. Bake at 350 degrees Fahrenheit for 40 - 45 minutes or until cake springs back when lightly touched. Immediately invert pan; cool completely before removing from cake pan. 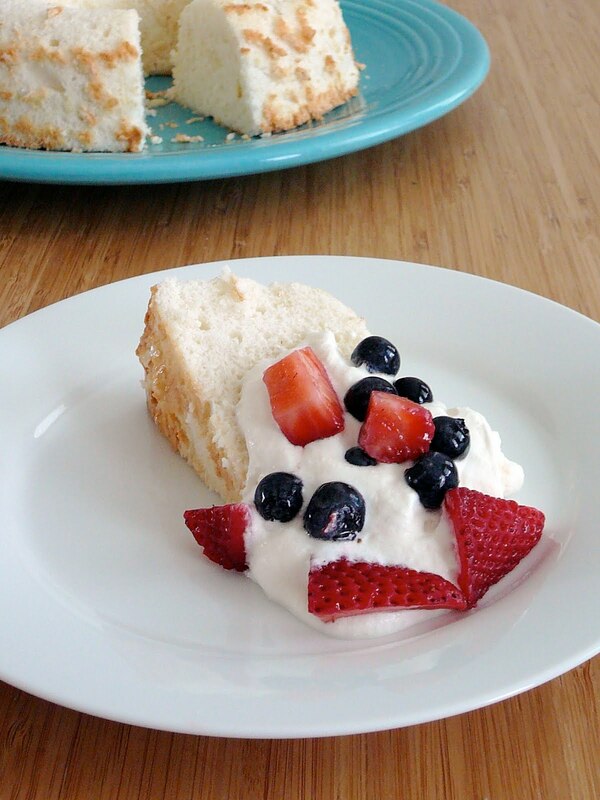 When cool, serve with fresh whipped cream and berries. In a chilled bowl with chilled beaters, beat cream until it begins to thicken. Add sugars and vanilla; beat until soft peaks form. Store in the refrigerator.